Thank you very much, my little angel. God bless. Very true, sweet sister Karina. I’m glad your father is better. Our hope is always on Christ, Jesus. Prayers for continued healing. Thank you very much,sister Kathy. Thank you for your prayer. Amen! There is always hope in God. Happy Sunday and God bless. Wow Karina, Amen to your message. My prayers go out to you and your family concerning your father. By the stripes of Jesus, I pray that He be healed in Jesus’ Name. God Bless you sis! Thamk you very much for the lovely comment​ and thank you for your prayer. God bless. Thank you very much,sis. I am grateful to have parents who always encourage and strengthen me when I am weak. Thank you and God bless. Yes I am grateful too my mom always stand beside me to encourage and strengthen me. You are welcome, Lauren. I thank you for your kindness reblogged my post. thank you Lauren, God bless you. Katrina, praise the Lord for the hope revealed to your mother, wisdom and hope that He has passed to you, and for His working for your dad. May you continue to grow and witness of the grace and knowledge that is ours in our Lord Jesus Christ. Have a blessed day. Thank you very much for lovely comment and for the Prayer to us. It means so much for us. Thank you and God bless you. God is love and God is a God of Hope! Love the story of the candles. I have not heard that before ….that and the verses was so good! Thank you. Thank you very much for the nice comment. The story is based on a poem titled “Four Candles” Once again thank you,Grandma. God bless. Thank you, Lady Jay. God bless. I love the Biblical definition of “hope” – confident expectation of the future! It’s so different from the definition the world gives – a desire that it will happen, but no certainty. Hoping in God is always certain! Great post! So glad your dad is on the mend; I pray for you both daily. Thank you, sist.. have a great and blessed week. Thank you very much for your lovely comment​ 🙂 Actually I am who really proud have parents like them.. learned so many things from them.Thank you so much for your prayer, sister. God bless. Thank you very mich 🙂 God bless. Beautiful post Karina! Praise God for your father’s healing, and the hope you had in Him. Hebrews 6:19 is one of my favorite verses, “We have this hope as an anchor for the soul.” God bless you! I nominated you for an award on my blog (the post will be up Wednesday morning) if you’re interested. Keep up the good work. You always seem to flash me back to my young Christian catechism days. Faith, hope and love. If more of the world took in that last virtue, the other two would be much easier to contemplate and eventually accept in our hearts. Peace, Karina. Thank you very much for you lovely comment. Yes I agree with you 🙂 Thank you and God Bless. Karina- living by Hope . You are welcome 🙂 Thank you very much. God bless. Hope is the transparent honesty of faith anchored in the work of the Lord in us, from the very beginning of our new life in Him. Dear, brother in Christ Gary. Beautiful message Karina, your mother is very wise. So glad to hear of your Father’s recovery. Peace, love to you and Happy Mother’s Day. Thank you very much,sister Lilka. Happy Mother’s​ day. God bless. Thank you very much, brother in Christ Rick. I love poem/poetry and you poetry is the one I love..:) Thank you and God bless. It’s True Karina when our Focus is on The Lord we have Eternal Hope. 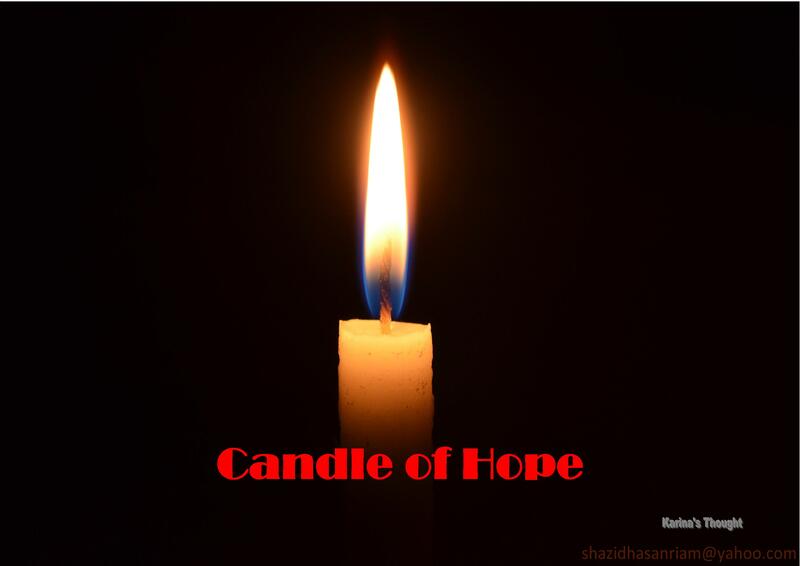 I have a Power Point about Candles and one is called Hope, your Story reminded me of it. I will leave the Link for you Karina in case you would like to see their significance in our lives. Thank you very much for the PP file 🙂 That is very good as my pondering. God bless, sis. Hi Karin. It has been a while since we have talked and it is good to hear your father is doing well. This is a very good post on hope and presented well by way of the candles. I hope you are doing well also in assuming your new duties as both a business woman and an encouraging daughter. Take care and say hi when you can, sis. I am so sorry missed your comment on my post. I doing well and my dad also in good condition but still under control the medical team. Thank you very much for the encouraging comment, brother 🙂 I hope and pray you are doing well too. God bless. What a beautiful testimony. You truly have a gift. Thank you for liking my blog posts so consistently. I trust they really are a blessing to you. May you indeed be filled with peace, faith, hope, and love, but remember, the Bible says the greatest is love, because it’s from God’s love that we can have all the others. Thank you so much for this wonderful reminder that hope is a flame that always burns bright when we trust in him. You are welcome 🙂 Thank you for reading and liking my post also for the Bible verse. God bless. I love it when you share from your life–especially about things that are difficult. It gives me strength and hope to read about the way you’re dealing with your father’s health crisis. Thank you, Karina, for this post and for your visits to my blog. End of life matters are incredibly difficult for everyone. Thanks for sharing your Mom’s story and the way it helps you think about your Dad’s health challenges. I pray your candle of Hope will burn so brightly that it brings all the other candles back to life! You are welcome,sis 🙂 Thank you very much for the heartwarming response on my post and also thank you for your prayer 🙂 we have too make our candle of hope keep light up brightly and bring the light to others. Thank you and have a great Sunday. God bless,sis. Thank you very much for reblogged my post to your blog. What a great honor to me. Hope and pray could be a blessing to others. Thank you and God bless. I Pray that God may bless you and that your post may touch the hearts of those needing comfort and a prompting to draw closer unto Him. What a testimony, and the story about the candles couldn’t be further from the truth regarding love, peace, faith, and hope. Thank you very much, dear brother in Christ David. Goe bless. Thank you very much, dear 🙂 God bless. Karina, I am new to your blog. I just want to say that you have a very beautiful blog. I see God using you in a very special way. Using your personal experiences to minister to others as your faith, hope, love and trust gives Him the Glory that only He deserves. What a such a wonderful greeting 🙂 Thank you very much for your lovely comment about my blog. Actually our personal experiences with God are endless source of inspiration to write a post. Any way, I love you blog too and I strongly believe I will be blessed through your blog posts. Thank you,Cristina. Hope and pray we will be a good blog friend 🙂 God bless you. Thank you Karina. 🙂 Blessings! Your are welcome 🙂 Thank you for the nice comment. God bless. I had to send this link to my dear once to read this…. Thank you very much for your kindness linking my post to your beloved once. Hope and pray it will be useful and be blessing to others. Thank you and God bless. Thank you so much for visiting and reading my post.. Ok I will come to your blog and read your posts..Thank you for following me also. Have a great Sunday. If you find it interesting please follow me, it would mean a lot to me! Thank you for the 4 candle story and your faith! I apologise for the long late reply. You’re welcome. Thank you for reading my post 🙂 God Bless. Thank you for your lovely words also thank you for reading my post..God Bless.